Gabriela Egito (“Gabby”) went two for two at the festivals this month. 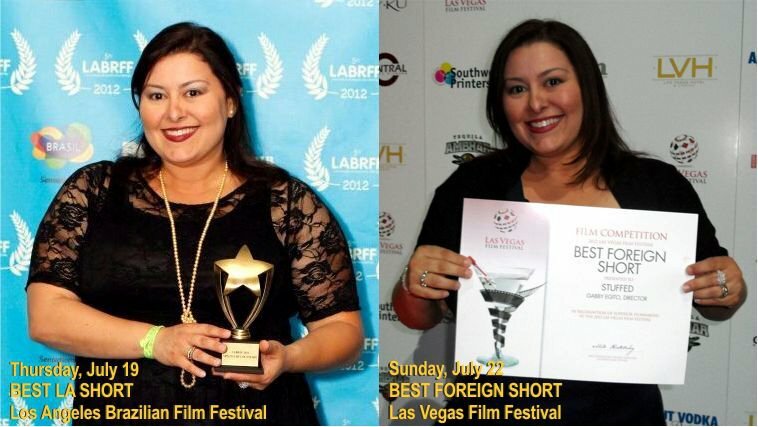 Her thesis film, Stuffed, shot during her one-year filmmaking course, won Best L.A. Short at the Los Angeles Brazilian Film Festival and Best Foreign Short at the Las Vegas Film Festival. These were the second of three prizes awarded to the thesis film, as it had previously won Best Drama Short at the Atlantic City Cinefest. Gabby had also previously produced the film Synergy during New York Film Academy’s 8-week film workshop, which won an award and was selected to more than 10 international film festivals. In total, Gabby has received 4 awards as a writer, director, producer, and editor, since being enrolled in 2010. After winning the awards, Gabby sent a note to the school saying, “Thank you so much for supporting me and providing the wonderful hands-on training that lead me to make this happen.” We wish her all the best on her filmmaking endeavors and hope the awards keep piling up! Read more about Gabby’s winning ways in her recent mention in the Hollywood Reporter.